The first phase is nearly achieved. Cost amout 380 000 euros VAT not included. Replanting of vegetation will probably take place in autumn. Estimated work cost for the second phase: 1 200 000 euros VAT not included. A financial help request at european level is in progress. overlooking the banks of the Agout. Spectacular is the word that best describes the works launched on the banks of the Agout, prompting councilman Pierre Bonhomme to say that "a major advance has been made towards the protection and safety of the site." The cliff had been crumbling down inexorably, and passing time only made it worse. Poor decisions were made and damage became more severe, causing much gnawing of teeth. However, back in 1988, the Bureau of Mining and Geological Research carried out a study focused on the unstability of various sectors along the river. Some ten years later another consultancy firm acting for the joint association for river monitoring Thoré-Agout focused its attention on the area comprised between the rue du Port and the Jardin de l'Evêché. The prevailing solution at the time was to preclude any further water discharge that might affect the already unstable embankment. In 2009 the Town requested an even more detailed study of the area. 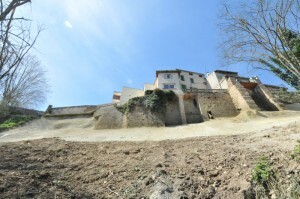 The results of this study, along with the significant dysfunctions in several buildings of the rue Villeneuve, made it a priority for local authorities to launch cliff reinforcement works beneath the said buildings. Applying the principles of reinforcement meant clearing the area to be treated of all vegeation and unstable soil. Subsequently the wall was nailed using metal piles sealed into the rock. An iron framework connecting the nails was installed, and finally a layer of projected concrete 20 cm to 50 cm thick was applied. It is worth noting that the type of concrete used aquires an earthy color as it sets, in accordance with guidelines from the Bâtiments de France expert (a state-sponsored corporation working for the preservation of the national architectural heritage), making it inconspicuous in the surrounding area.